The easy way to grasp customer analytics, Ensuring your customers are having positive experiences with your company at all levels, including initial brand awareness and loyalty, is crucial to the success of your business. Customer Analytics For Dummies shows you how to measure each stage of the customer journey and use the right analytics to understand customer behavior and make key business decisions. Customer Analytics For Dummies gets you up to speed on what you should be testing. You’ll also find current information on how to leverage A/B testing, social media’s role in the post-purchasing analytics, usability metrics, prediction and statistics, and much more to effectively manage the customer experience. Written by a highly visible expert in the area of customer analytics, this guide will have you up and running on putting customer analytics into practice at your own business in no time. Shows you what to measure, how to measure, and ways to interpret the data. Provides real-world customer analytics examples from companies such as Wikipedia, PayPal, and Walmart. Explains how to use customer analytics to make smarter business decisions that generate more loyal customers. Offers easy-to-digest information on understanding each stage of the customer journey. 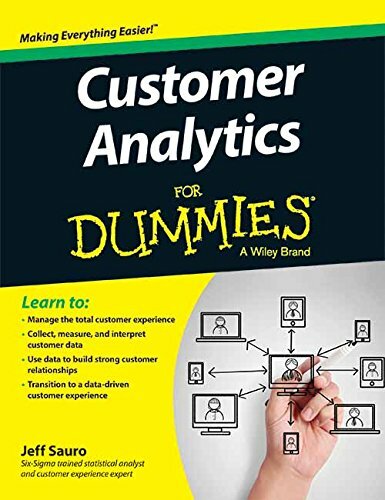 Whether you’re part of a Customer Engagement team or a product, marketing, or design professional looking to get a leg up, Customer Analytics For Dummies has you covered. About the Author Jeff Sauro is a Six-Sigma trained statistical analyst and pioneer in quantifying the customer experience. He writes a weekly column at measuringu.com and has been an invited speaker at Fortune 500 companies, industry conferences and as an expert witness. Buy the book Customer Analytics for Dummies from Ideakart.com.